The Ohio Republican Party knocked Richard Cordray, the Democratic candidate for governor in the state, on Tuesday for hypocritically attacking his GOP opponent. The back-and-forth began when Cordray, who served as Ohio attorney general from 2009 to 2011, criticized Republican opponent Mike DeWine for not taking action against the Electronic Classroom of Tomorrow (ECOT) sooner. He said the action from DeWine, the state's current attorney general, was "too little, too late!" ECOT's founder Bill Lager is under fire from DeWine for having his for-profit school work with two of his other companies, Altair Learning Management and IQ Innovations. The accusations include Lager directing funds to a company run by his daughter, the Columbus Dispatch reports. The attorney general's office said ECOT overstated how many students it had, which meant the state was paying for nonexistent students. "ECOT’s contracts with Altair and IQ constituted corrupt activity because … there were multiple contracts, Lager participated in that pattern, and ECOT was injured by paying funds pursuant to contracts that were void as a matter of law," DeWine's office wrote in a court filing. "He violated that duty by doing business with ECOT through two companies he had substantial interests in: Altair and IQ," DeWine's office wrote. "That entitles ECOT to recover all profits Lager realized through those companies’ dealings with ECOT." 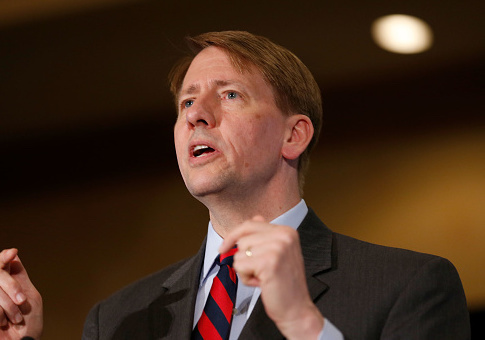 Cordray went after DeWine on Twitter for not acting sooner. "With four months to go in a tight governor race, @MikeDeWine finally calls ECOT ‘corrupt.’ But he couldn’t find a way to say it when it would have counted, as they made off with $180 million of ill-gotten gains through lying about their attendance records. Too little, too late!" With four months to go in a tight governor race, @MikeDeWine finally calls ECOT "corrupt." But he couldn’t find a way to say it when it would have counted, as they made off with $180 million of ill-gotten gains through lying about their attendance records. Too little, too late! In response, the Ohio Republican Party fired back at Cordray, questioning why the former attorney general did not then take action against ECOT or Lager. "With four months to go, @RichCordray continues to prove he is all talk, no action," the Ohio Republican Party tweeted. "Richard Cordray was Ohio AG from 2009-2011. What did he do about ECOT? Nothing." DeWine is hoping Lager will be forced by courts to return up to $200 million to the state. Lager had donated substantial funds to Ohio Republicans in the past; however, the party returned a total of $76,000 to both Lager and one of his aides. DeWine donated $12,532 to charity that Lager had contributed to his campaign. This entry was posted in Politics and tagged Corruption, Governor, Ohio, Richard Cordray. Bookmark the permalink.